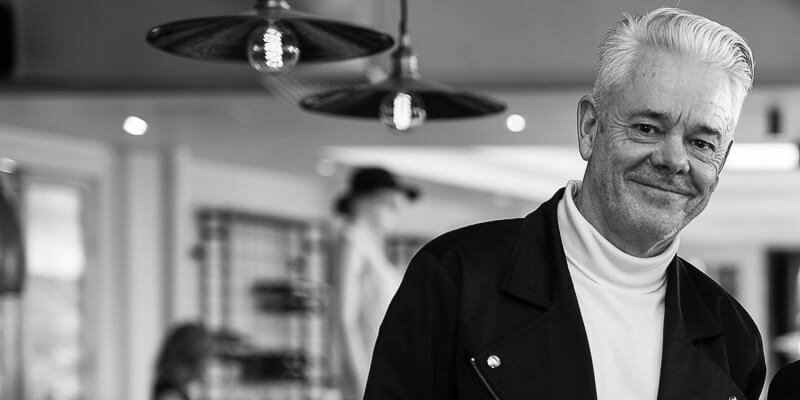 TheTrendSpotter was fortunate enough to sit down with TOPMAN global design director Gordon Richardson during his recent trip to Sydney. We asked him about the direction he’s taking for the popular highstreet brand, as well as the latest trends, the design process, and of course Mr. Richardson’s impressive fashion background. What brings you here to Australia, do you come here often? We are passing through on our route to New Zealand at the end of this week. We’ve come to host this TOPMAN event in Sydney to meet and greet press and bloggers. We are here to talk about our ranges and collections, it is a way for us to communicate our love for our clothes to the Australian audience. We are here to learn more about the different cities and their characteristics. How long have you worked for TOPMAN and what was your journey before you got this fabulous job? I have to bite my tongue a bit when I say that I worked for TOPMAN for 16 years, before that I worked for The Arcadia Group for another brand. I loved every minute of it and I am part of a really good team who’s been with the brand from the senior level when they started to resurrect it. I used to teach fashion for about 10 years in one of the big schools in London. I love working with young people and I love the new ideas. TOPMAN is all about the young fashion, change, it is exciting and lively. I am lucky to be working for TOPMAN, it really is a dream job. Working with young people keeps me young, because I am an old boy now. I love going on the trips with some of the younger members of our team. When we visit a vintage fair like Pasadena in LA, when they see something, they see it for the first time, but when I am seeing it I go ‘oh I’ve seen it before, YSL did that.’ When they see that they tell me ‘no it’s cool’ and I love that because in a way they are teaching me to look at things in a completely different way. TOPMAN has a team of about 25 different designers, a pattern room with all the new machinery and graphic team that does all the print work that you see in the TOPMAN, it is all generated in-house. We have a team of core designers who design the actual product. We get inspiration from absolutely everything. The simple answer to this would be to just to be observant 24/7. We could be out on international trip, doing street watch, blogs, shows, film, music are some of the best inspirations. Nowadays there are so many more sources of inspiration. Around 14 years ago there was less information out there, you had to really go and look for it, now its different, it is all very accessible. We go out there and seek this information, bring it back and distill it. We make sense of it for our TOPMAN customer. We aim to do all our fashion homework for our customer. Our customers are very different, they see fashion in a different way, and they love different things. If we have five boys walking into our stores, we hope to see them walking out of the stores looking different. There is no one particular look. I love the challenge of making menswear new but not making it so obscure and difficult that it becomes hard to wear. When you think of TOPMAN, it’s very straightforward clothes, we are not doing jackets with three sleeves, do you know what I mean? They are recognizable items the boys like but there is uniqueness about them. Tell us some of the menswear trends that we can look forward to seeing this season? “Heritage” was one of the biggest trends last season. It is a very British tweedy look: jackets and brogue shoes. It is now gone, and its much more about sports luxe, and classic tailoring, the merge of the two very distinct areas of menswear. Fabrications and cuts that come from the sportswear, mixed with classic tailoring. It is like this whole new language of menswear. What future plans do you have for TOPMAN? It’s a good question actually because we don’t really sit down and think the future is going to be like this and like that. The future is almost inaccessible. The less we think about the future, ironically, the better we will be because we are reacting in the present. We are here to understand this market and to react as quickly as we can to benefit the market we are in. We have got plans to expand here, in USA, and in Europe. We have just opened our first store in Amsterdam. And there will be more expansion. The future is exciting, as you don’t know what’s going to happen and fashion changes. The social media space has changed everything phenomenally; the dynamic of communicating fashion to the masses has changed. Men are so much more interested in fashion and they know where they can find it. There are so many mediums and platforms to be excited about fashion. Men never talked about fashion the way they do now. What do you think of the unisex trend? Its healthy and inevitable. A simple product for example like skinny jeans, it started in womenswear and now it is so popular for men. There is a merging of the influences across menswear and womenswear. It is not unisex, it is clothes that have similarities and often women and men tend to dress alike, they tend to reflect each other. For example Jacqui and I are dressed very much alike today. A lot of women love TOPMAN, a lot of it can be used as a great weekend wear. What are you feelings towards smaller brands and retail giants? TOPMAN always supported the younger designers with designer collaborations. We help them to bring a brand in their own right. We support the British Fashion Council. It’s important to have the retail giants as well as the small boutiques. The future of this marketplace is the younger designers and their ideas. We are very proud to supported the young designers.